Great kitchen design is very important as it lays the foundation for all the work to be done. It can take 6 to 8 weeks to get the design right depending on the level of customization. The appliances, furniture, and kitchen features must be made to fit, and any tweaking subsequently affects other measurements and fittings. There are mainly 3 options in sourcing for kitchen cabinetry; buying customized and pre-cut such that you only install. There is also the option of buying the building material and assembling on site. The last option is buying a flat pack kitchen which only needs fitting into place. All 3 approaches have advantages and disadvantages. You have to wait up to 12 weeks for custom made pieces, especially if you are importing. Flat pack packages take around 4 weeks to be delivered. Taking down the old fittings and cabinetry should take 2 days at maximum, save for some unforeseen circumstances that may extend the demo process. Prepping then begins. This could take up to 4 weeks if there is any structural work to be done on the walls, like shifting one wall to make the kitchen larger. Other structural changes involve shifting of plumbing, gas and electrical lines. This may require a permit, which could take more time. After prepping is complete, the next phase is installing the cabinetry and countertops if they have been delivered. It is relatively easy to install these items if they have been made to measure accurately. Marble and stone countertops typically require more work than laminate countertops. The backsplash is installed at this phase as well. This is the final stage of the renovation. Most appliances only need to be plugged in and switched on. Other fixtures that finish the look include décor lighting and any wall art. Do you need to renovate your kitchen? 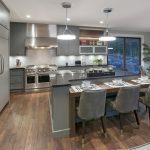 Bow Valley Kitchens will be your partner in this project. 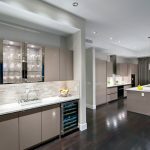 With extensive experience in complex kitchen renovations, we will help you build your dream kitchen.